What will become of Williamsville's only baseball diamond? There aren't many home runs, pop flies or strikeouts at Williamsville's only baseball diamond these days. The little-used ballfield in South Long Park has been reserved twice in the last 18 months. Now, it's the center of a contentious debate roiling the village more than any other issue since the future of the historic Williamsville Water Mill was at stake. Under the terms of a proposed parkland swap, Natale Development would build an 80-unit apartment complex on the site of the 1.8-acre ball diamond a block south of Main Street. In return, Natale would transfer to the village an equal portion from the 6 acres it purchased last year on California Drive. Natale would build 42 townhomes on the rest of the California Drive property, formerly the home of Darling Construction, in a housing development called Asher Crossing. Land swap opponents call the ball diamond a much-loved and valued greenspace ideal for spontaneous pickup games. Opponents of the land swap — organized under an LLC named Protect South Long Park — want Natale to build only on the land it purchased from Darling in 2016 and leave the park intact. But supporters of the swap say it would result in a bigger and better South Long Park by connecting to the nearby Lehigh Valley train depot and walking trail. For several months, marathon discussions among capacity crowds at Village Board meetings have routinely stretched for as long as two hours. Residents have presented petitions, threatened lawsuits and brought homemade maps to make their points. 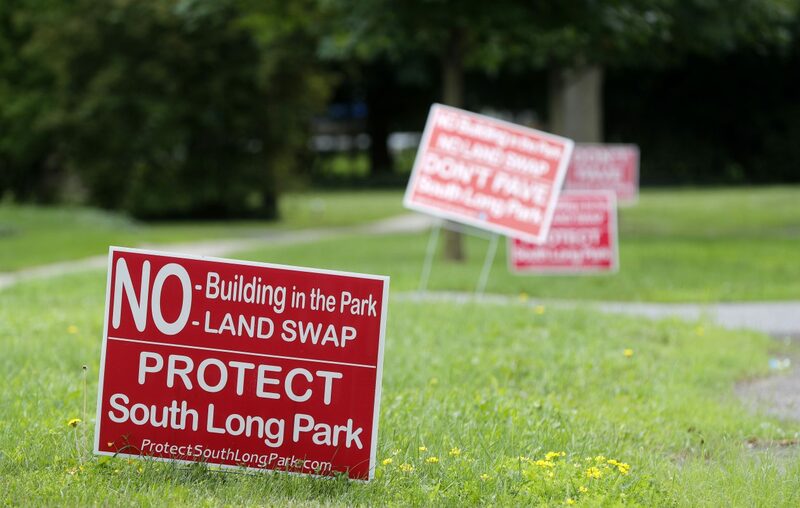 Bright red "Don't Pave South Long Park" signs have sprouted in front of homes throughout the village. Those signs line Garden Parkway, just south of the ball diamond, including in front of the home of Ana Forsberg and her brother Felipe Lopez. They use the park regularly and have seen people using the ball diamond. "We like to go there," Lopez said. "We like the young kids around here to have something to enjoy." Opponents also cite the traffic the apartments would bring to South Long Street, which already has truck traffic from International Chimney and the village's Department of Public Works. "It's bad with the traffic already," Forsberg said. "People do over 30 mph. Imagine another apartment complex with all these other cars and it just creates more chaos." Even a proposal to survey residents about their preferences has turned controversial. Public opinion appears to be split, said Village Trustee Deb Rogers. "Wherever this decision ends up, you're not going to have 100 percent happiness," she said. "As a board member I'm trying to take my personal beliefs or bias out of the situation and look at where we're at with this project." In early March, residents participated in a planning exercise involving pushing Legos around a map in Village Hall. The parkland swap idea was born out of that meeting. A December 2008 survey by the village's Parks Committee found that if any improvements were made at South Long Park, nearby residents preferred adding a natural ice rink, more trees and walking paths. All of those amenities were included in conceptual renderings of what a new South Long Park would look like after a swap. Improving existing baseball facilities ranked low on the list, receiving only 3.6 percent of votes cast in the survey. In fact, the ball diamond was not reserved even once in 2016, and only twice in 2017, according to village officials. It was reserved on April 18 for a baseball practice and on July 11 — not for a baseball event but for the Cure JM fundraiser. Otherwise, the diamond is used on a first-come, first-served basis. Tim Servoss, a neighborhood resident using the tennis courts with his son on Friday, played on the diamond in a softball league several years ago but hasn't seen any organized use. "As a resident of the neighborhood I'm just concerned about traffic, with the little guy, you know? That's my primary concern," he said. "So my personal opinion is I'm willing to make some personal sacrifice in order to keep the traffic down. If that sacrifice is a land swap then I'd probably be OK with it." Maintaining the clay diamond is also expensive, said Rogers. "If that field was getting used a lot, people were reserving it at Village Hall and I saw a game on at least one occasion I would say, 'OK, maybe this is something we need to really look at and not let go of,' " she said. "I just can't say that I've seen that." A decision is months away, officials said. And State Legislature action on the proposal would probably not happen until after the 2018 state budget is approved in April. Village officials also are awaiting an estimate due this week on the cost of getting the 1.8 acres of the former construction yard up to parkland standards. "Once we have that number we can sit down and figure out how we're going to make that happen with the developer," Rogers said. The village has maintained the park since 1948, and many longtime residents may have memories of playing on it. "It's kind of like, now there's a threat that 'Boy, that ball diamond we grew up on when we were kids and we loved playing on may no longer be here,' " said Rogers. "I get that there's a sense of nostalgia and people in general don't like to see change. But sometimes change can be a good thing."